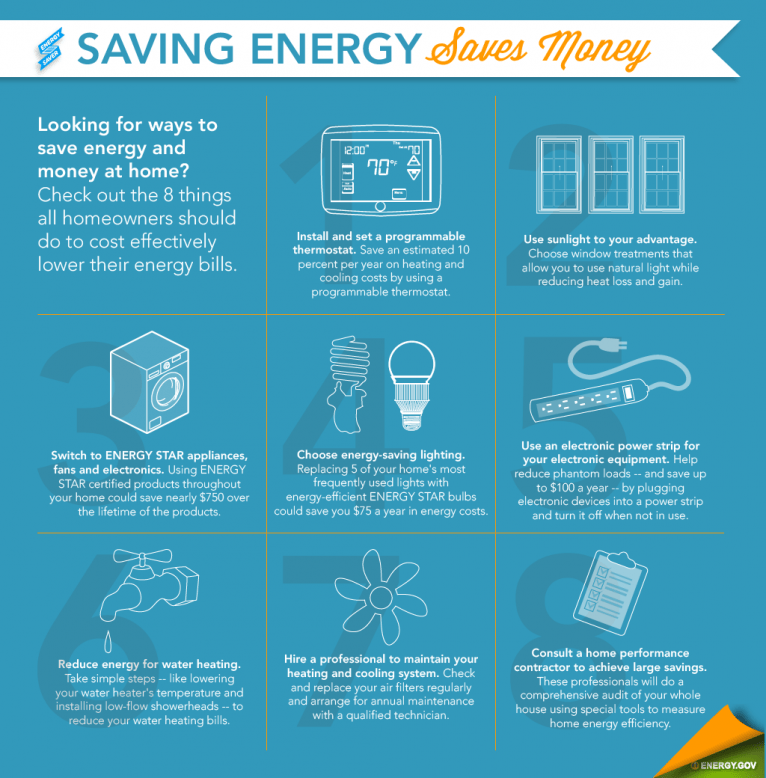 Need some ideas on resolutions to make your home more energy efficient? To get you started, I consulted with our experts in the Building Technologies Office — who work on developing innovative, cost-effective solutions to saving energy — to create a list of the top ways to save energy and money at home. They came up with eight strategies all homeowners should adopt to lower their energy bills no matter the time of the year or their price range. Some tips are free or low cost and can be used daily to increase your energy savings, while others require a larger investment for long-term savings. This year, resolve to try one or more of these tips for improving your home’s energy efficiency, and start seeing savings on your next energy bill. 2. Use sunlight to your advantage. The sun’s rays can contribute heat in the winter but force air conditioners and fans to work harder — and use more energy — in the summer. During winter months, you can take advantage of sunlight by opening your curtains during the day to allow the sun to naturally heat your home. During warmer months, use light-colored window shades or blinds to reflect heat back outside, keeping your home cooler and more efficient. Using natural lighting effectively will also reduce the need to use artificial light. 3. When replacing appliances or purchasing electronics, look for ENERGY STAR appliances, fans and electronics. Your home’s appliances and electronics account for close to 20 percent of your energy bills. Using ENERGY STAR® certified products — which incorporate advanced technologies that use 10-15 percent less energy and water than standard models — throughout your home could save nearly $750 over the lifetime of the products. For example, ENERGY STAR clothes washers use about 40 percent less energy than conventional clothes washers while reducing water bills. ENERGY STAR washers also require less detergent and are gentler on clothes, saving you money on clothing expenses. 4. Choose energy-saving lighting. About 10 percent of the energy your home uses goes to lighting costs. By just replacing five of your home’s most frequently used lights with energy-efficient ENERGY STAR bulbs, you could save $75 a year in energy costs. Compared to traditional incandescent bulbs, compact fluorescent bulbs can yield as much as 75 percent energy savings and last six-times longer. You can get even more energy savings, longer life span and less wasted heat by switching to ENERGY STAR LEDs. 5. Use an electronic power strip for your electronic equipment. Many electronic devices and equipment continue to consume unnecessary energy even when not in use. Often called energy vampires, these devices cost families about $100 a year. Use a power strip for electronic devices and turn it off when not in use to eliminate energy vampires. And be sure to unplug your chargers — they draw energy even when they aren’t connected to a device. 8. Consult a home performance contractor to achieve large savings. There is a growing industry of professionals who are qualified to make recommendations to homeowners on how to improve the overall energy efficiency of their homes. These professional energy assessors will do a comprehensive energy audit of your whole house using special tools — such as a blower door test and an infrared camera to locate air leaks — to measure home energy efficiency.